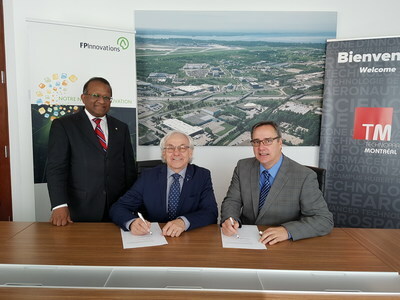 MONTREAL, Oct. 20, 2017 /CNW Telbec/ - Technoparc Montréal and FPInnovations today concluded the purchase of lands by FPInnovations for its establishment at the Technoparc de Montréal. The lands, totaling more than 360,000 square feet (33,400 square meters), are in the southern part of the Technoparc de Montréal, the Eco-campus Hubert Reeves section. "I am pleased in regard to this first step toward building an integrated international biomaterials innovation centre under FPInnovations' leadership. This is an opportunity for the greater Montreal area as well as for the Quebec and Canadian forest industry to lead the way in the field of biomaterials and clean technologies," said Mr. Pierre Lapointe, President and Chief Executive Officer of FPInnovations. "The location chosen at the Technoparc will allow us to get closer to our current partners, to facilitate travel for our collaborators, and to allow our employees to work within an environment that promotes innovation and cooperation," he added. "We are very proud of this transaction, which marks a real kick-off in the development of the Eco-campus Hubert Reeves. FPInnovations corresponds exactly to the type of resident companies looking for a workplace with a perfect symbiosis between humans and nature. 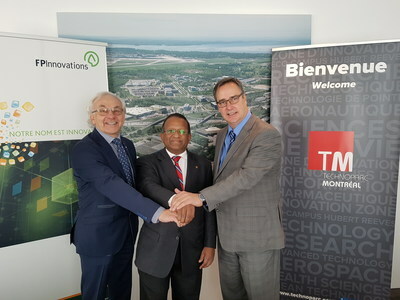 We are convinced that the arrival of FPInnovations will attract a growing interest for companies wishing to settle in an environment where nature protection is a priority," said Mr. Mario Monette, President and CEO of Technoparc Montréal. "The Éco-campus is a unique site in all of North America. It was designed to welcome clean-tech research firms—a sector that we want to develop in Saint-Laurent. In fact, this type of company wants to locate in an environment where biodiversity is preserved… And that's one of the main values of our own Administration! The agreement that has been signed with this first company confirms the vision of long-term development of our territory, and the Borough Council members and I are very proud of this," stated the Saint-Laurent Borough Mayor Alan DeSousa.